Today I don't have too much to share with you. There aren't too many new things happening here WIP-wise as I have not been around to do most of them. Last weekend I had a stand at a craft market and then had to help out at the girls annual Bazaar the following day so craft-wise I didn't have any time. I am not going to bore you with similar pictures as last week, instead I will just update you on the newest WIP. The Ravenclaw Scarf is off the loom and will be shared with you all on Friday. Above is Kay's Scarf, which I warped and began this morning. I am using Drops Baby Merino which I am finding a real pleasure to weave with. 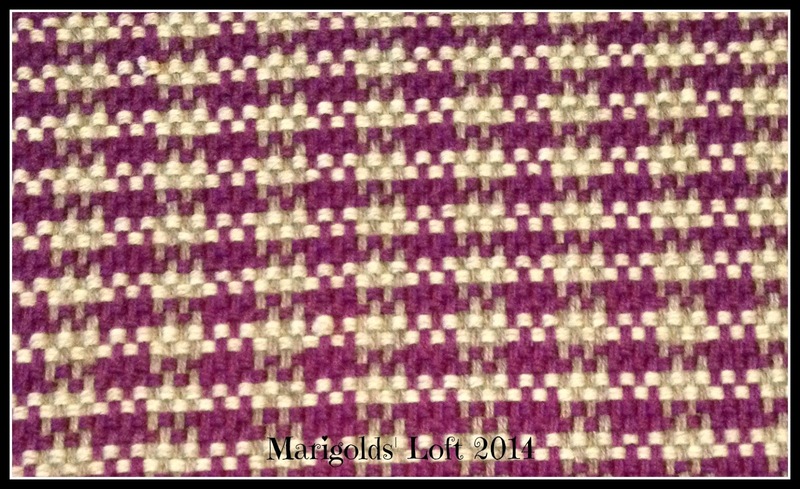 I really enjoy making narrow warps and am slowly getting to grips with the loom. It has actually become fun to warp it too, something I never thought I would say! I have made a change to this projects original design. This would not have been a problem had I not been so anxious to start the Ravenclaw scarf! As the Ravenclaw scarf only needed a little for the striping I ordered 2 balls of the number 19 yarn which would have definitely been enough. As I approached the end - literally the end, of the warp I was just about to run out of the grey, so I went to grab two more balls of number 19 to find that there was no more - suddenly I realized what I had done, but I had two more holes to fill and I wasn't going to redo the warp so I managed, just barely, to finish the warp with the number 19. I had originally planned a houndstooth pattern for her scarf but now had no more of the grey wool number 19, instead I had a whole bunch of the number 22 grey yarn. Well, either re-order and wait (Right, like any crafter can just wait once raring to go!) or use the lighter grey (22) for the weft. So, in true itchy finger style, I have begun the project with the number 22 instead of 19. I like the look of the project so far, given it is no longer a houndstooth pattern, but I like the depth the two greys give the project. Do you adapt according to tools available or do you stick to original plans with your projects? Dear Natalie! I have no words! The scarf is so beautiful!